The Apple Watch has been an excellent workout tracking device for SportTracks for a while now, but a recent update to the HealthFit app has expanded the capability of this integration. Now, in addition to being able to use Apple Watch to track all of your activities, HealthFit syncs your daily Resting Heart Rate (RHR), Heart Rate Variability (HRV), and VO2 Max — and you can now view and analyze this data in SportTracks. In addition, if you use a Withings smart scale, HealthFit will send your daily Weight and Body Fat readings to SportTracks. We've had a seamless auto-sync integration with the Withings smart scale since 2014 (SportTracks provides auto-sync with the Garmin Index Smart Scale as well). This update offers a new way to sync your weight data. With just a little adjustment to your SportTracks Health Page, you can start monitoring these metrics. If you're doing lots of training and your RHR is lowering as you get more fit, it's nice to see this on a chart without requiring you to take any manual readings. To get this data into SportTracks you are going to need an Apple Watch, and you need the HealthFit app on your iPhone. 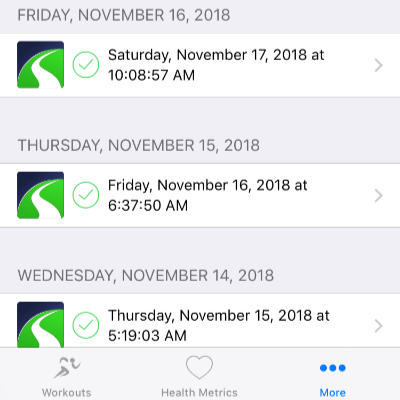 The HealthFit app has a one-time fee of $2.99 USD, but it's a fantastic tool for using Apple Watch with SportTracks as it can easily be set up to automatically sync all of your workouts and health data. Open the HealthFit app on your iPhone. You may be prompted to visit the Apple Health app to allow HealthFit to access your health data types. If this is the case, select Turn All Categories On in the Apple Health app. It's worth noting that when you visit the Health Metrics Synchronization page in HealthFit, you can see the history of your recent uploads to SportTracks. Green checkmarks are displayed to show that the sync did not have an error. It's just nice that there's a way to check to see if all of your metrics are being synced. There are many great watches available to track your workouts from Garmin, Suunto, Polar and other manufacturers. While the Apple Watch certainly isn't the best choice for everyone (you need to own an iPhone to even use an Apple Watch), it is an appealing option for some. There are several great apps for tracking workouts on Apple Watch, such as iSmoothRun, which offers support for running power meters. Apple's default Workouts app is also useful, especially for tracking swim workouts, as it records detailed stroke data and underwater heart rate. The new Series 4 Apple Watch offers a remarkably large display, and has a feature called "Fall Detection" which can identify when you trip and fall and do not get up. It will automatically contact emergency services on your behalf and provide your GPS coordinates if you do not recover from a fall. It's a reassuring feature for long runs, trail runs, and cycling. You just need to remember to manually enable Fall Detection in Settings when you get the watch.